This is a continuation of my previous post, discussing the nature of the secret underground kingdoms in Twelve Dancing Princesses variants, as found in Heidi Anne Heiner's Twelve Dancing Princesses: Tales from Around the World. In Denmark, the Princess dances each night with a troll. The hero of this tale kills the troll himself, and once he does, "all the trees, flowers, and grasses turned into as many men, women, and children. They were so happy to be released from their enchantment that they begged him to be their king." 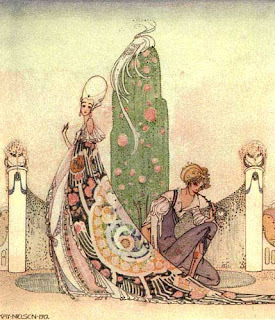 The Princess, who throughout the tale had been glad at the death of each man who attempted to find her secret (this city is surrounded by the "chopped-off heads of human beings," those who failed), was also under an enchantment, and never given any blame for the many deaths she caused. A Portugese version took a Christian Princess on a journey so hard she wore out thirteen pairs of iron shoes each night, visiting a giant, who was a Moorish Prince she was in love with. I was rooting for this couple-it has similarities to Cupid and Psyche, or maybe just because my own Prince Charming lives an hour away...but in the end she decided that to do so for the twenty years left in his enchantment would be "tortuous" and so she married the man who discovered her secret. I'm sure cultural religious prejudice had a lot to do with the outcome of this story. A Princess from Cape Verde goes to a palace filled with forty men, and she is the only woman there. Though the story itself gave no indication that the men were evil, in the end the hero chooses not to marry the woman who dances with devils and went on his way. One Turkish woman was under a spell: a Peri king "had carried her off by force from her room one day, and so enchanted her with his power that she had been unable to set herself free." There are Bengali and Punjabi tales which are slightly less related to the Western Twelve Dancing Princesses, in which the women actually go to the house of the gods to dance each night, resisting their human husbands at first, eventually leaving their supernatural balls to live with their husbands. I've mentioned the Scottish Kate Crackernuts on the blog before, which is noteable for being a gender-reversed Twelve Dancing Princesses. 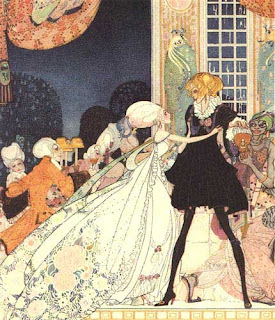 In this story she follows the Prince to a fairy ball where she learns the secret of healing her sister and the Prince. 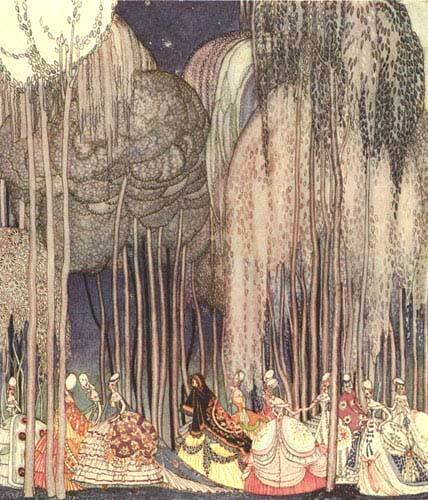 The Icelandic Hildur also goes to Fairyland, but not against her will. Her fairy lover is there, but his mother was furious at the match and cursed Hildur to live in the human world and only be able to make the journey back to Fairyland once a year, at Christmas, but the cost was that she had to kill a man each time. She was cursed to do this against her will until she was discovered and convicted of murder, unless "a man so courageous as to dare to go with me to the world of Fairies, and then be able to show plain proofs that he had been ther and seen what was done" could go with her. Because the hero fulfills the conditions of this curse, she is able to return to her true home and husband in Fairyland. The Princesses are sometimes willing and sometimes under a spell; the land they travel to is usually an evil and dangerous place in most Western versions but even then there are exeptions. Either way the reader is generally excited to hear about the forbidden journey and the supernatural secrets that are revealed. In her introduction to the book, Heidi Anne Heiner speculates that since the Princesses generally don't want to be rescued, that may be part of the appeal of the tale. What do you think, readers? Do you have a particular favorite variant? Why do you like or not like this tale? Jealous you've got your first SurLaLune series book! Oh, what I would do if I had an unlimited sum of money! I do love this tale, and so much of it has to do with the mysteries: that the reason the princesses go, willingly or not, is left silent, that the princes and underground kingdom are never fully explained. I'll have to think a little more on why these things are so appealing to me. 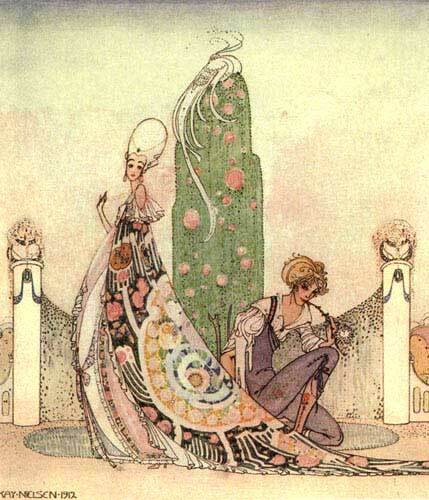 Fairy Tales as Alchemical Stories?